When I met my partner, Bob, in 1972, he was working part-time (evenings) in the Dive Bar. I got a job upstairs for 2 or 3 evenings a week. May and George were great. I remember them going out one night, all dressed up in evening dress and furs (May) for a boxing match in the East End. They were from Aldgate, originally. The Dive Bar was gay, or most of the staff were. Paul, Bryan, John from Enfield and Ron. Tony and Sue, Vera and Andy were regular customers. It was not always very busy down there! The staff all drank CC & Coke. Upstairs could be quiet too. Regulars there were Rose & Marie (the latter over 70 and still "on the game"), Chinese dealers and bent coppers. Highlight of the night was when the dance troupe and their dresser came in from the Talk of the Town on their "tea break". Alan Lake used to come in looking for Diana (Dors). 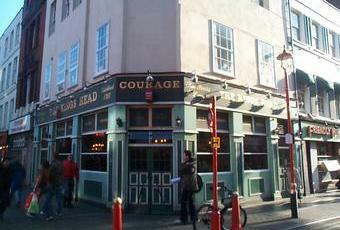 We now live in Spain but have fond memories of our 4 years at the Kings Head. We still use the egg spoons from a breakfast set May gave us when we got together. I was visiting london for work last week and was shocked to see it had been replaced by another restaurant. I worked there for a couple of years back in the early nighties.. the place was a special place, George and Mae were a wonderful couple - its sad to here he's passed away - i'll always remember him coming down stairs to the upstairs bar and spending ten minutes winding up the morning club (local gentlemans club manager, his head barman, a local classy prostitute and believe it or not occasionally the milk man) once they'd bitten he'd dissapear back upstairs hahaha. Sorry to see the guvnor died. I worked in the upstairs bar for a short while when I was 21. It was a great place. I'm 45 now living in Malta. The reason I thought of here just now was because I used to pinch a small pork pie off the bar and have some Coleman's mustard with it. I am tucking in to one as I write. RIP George. Lovely fella. Somebody once told me in the bar he was a jockey when he was younger. Anyone know?